The singer was inspired to include two-year-old twins Moroccan and Monroe on the record, after hearing them groove to the track. "It's a song that I wrote with Bryan-Michael Cox and Jermaine Dupri. There's a part that Jermaine says on the song... and Monroe started to say it," she told People.com. "I kept having to get my iPhone and record her. So I have all these different takes of her saying things, singing things. Then I'd be like, 'This is your new ad lib - learn it!' I have to make it fun for her." Roc and Roe wouldn't be the first kids to feature on their parents' music. Beyonce and Jay Z's daughter Blue Ivy appeared on Beyonce's song Blue, while Alicia Keys' son Egypt made his vocal debut on her track New Day. 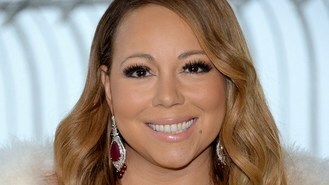 Mariah, who debuted her latest single You're Mine (Eternal) at the 2014 BET Honours, revealed her children have already started to show signs of creativity. "Well, they started singing and talking simultaneously. It's hard to explain. That sounds like a lie, but it's true. They're both so musical," she said. Mariah's 14th album, The Art Of Letting Go, is expected to be released in May.